From the moment you saw that thin blue line show up, you’ve been hyper-aware of your pregnancy diet. Tuna? No thanks. Risk of too much mercury. Lunch meat? Have to skip it. Listeria can cause miscarriages. We’ll skip the caffeine. There’s one thing, though, you really need to make sure your baby-factory is getting a lot of. Put down that double cheeseburger, sister. That’s not the protein I’m talking about. I’m talking about collagen. Cheeseburgers have protein, yes, but they also have a LOT of fat. And too much fat just isn’t your friend (or your baby’s). What’s so special about collagen protein? Your skin is being stretched beyond its normal size. Healthy elastic skin, improved by collagen, can prevent stretch marks. Your baby is going to pull nutrients out of your body and leave the leftovers for you. (Baby’s needs come first!) Adding extra protein to your diet will make sure you have enough of those leftovers to fuel your healthy body too. As baby gets bigger, your joints and bones are going to be under more stress. Collagen helps protect your bones and joints from the extra baby burden. So where do you find collagen protein? You find that awesome collagen in a yummy scoop of powder called Protiva. Here are three reasons I’m a fan. A recent study showed that 85% of all pregnant women have protein levels at or below the minimal protein range in the 3rd Trimester. (For those of you playing at home, that’s between 6.8 and 8.3 (g/dl). You need protein to keep your digestion healthy, your skin silky smooth, and even to speed up your childbirth recovery. Your baby needs protein to build strong neurons in the brain, healthy organs, and strong muscles to kick at the world. If your normal diet (assuming 85% of us eat a normal diet) isn’t pulling its weight in the power-protein department, it’s time to up your pregnancy diet game and get some outside help. Blended into a sweet and healthy breakfast smoothie like the recipe below, developed by one of our Mighty Mom Testers! Not ready to cook? Pin this image to your board, or click here to open in a browser to print. Strapped for cash? You can get a prescription for Protiva from your doctor and have your HSA or FSA pay for (or reimburse you) for the purchase! There are no artificial sweeteners, colors, or flavors added. They have a 30-day money back guarantee if you decide you don’t like the taste. There’s no health risk. There’s no money risk. There’s no reason not to give it a try. 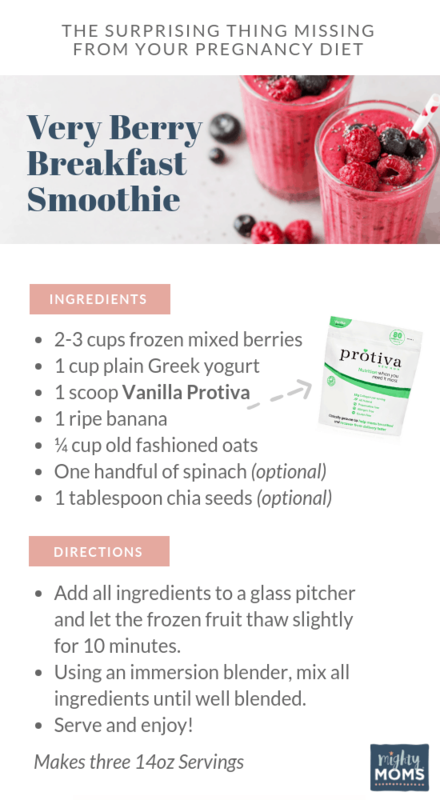 Since a few Mighty Mom Testers have already reported a happy experience with Protiva’s shakes, I’m excited to let several lucky readers share the same experience! The ladies over at Protiva want to give a month’s supply of Protiva to eight lucky MightyMoms.club readers! Here’s how to participate. Earn your random entries below. The giveaway starts at 12:00 a.m. CST on April 12th, 2019 and will close at 11:59 p.m. CST on April 18, 2019. You can see the complete list of rules here. Don’t forget, we have eight winning readers, so get your entries added below! Life doesn’t slow down for pregnancy, unfortunately. Somehow you have to maintain your current crazy life while making sure your body is getting all the nutrients it needs to create the next Einstein, LeBron, Billy Graham, or Brontë. It’s easy to spend a lot of time thinking about what your pregnancy diet shouldn’t include, but you need to also spend time thinking about what you SHOULD eat. After all, you know what they (as in me) say…. A scoop of Protiva keeps the grumpies away! Who can be grumpy with hair like a goddess, skin like silk, a healthy baby kicking like crazy, and a body that’s primed to recover from childbirth faster than expected? Add a little scoop of Protiva to your pregnancy diet this month. Your baby, hair, skin…husband…will thank you! 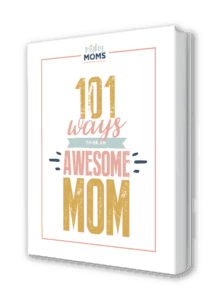 This article was sponsored by Protiva who also provided extra product for a few Mighty Moms Club members to try and report back. Our readers enjoyed the taste of the shake! If breakfast isn’t your strongest meal of the day, Protiva is the easiest protein-punch you’ll find all day.